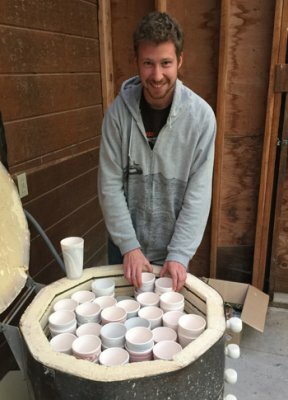 Sean Forest Roberts is the owner of Forest Ceramic Company, producing fine porcelain wares. His background in chemistry inspires his experimental studio practice, which has led to his current patterned porcelain cup series. Each of the patterns are made by hand, using colored slip, or liquid clay. General patterns can be repeated, yet the inherent randomness and delicate nature of this patterning process makes each cup completely unique.